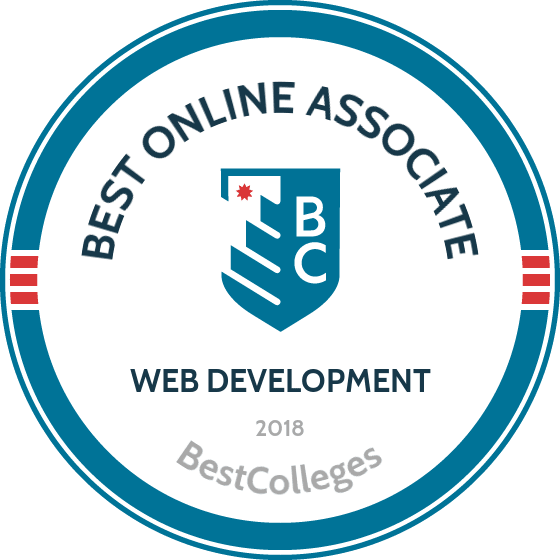 What Are The Best Online Associate in Web Development Programs? What Else Can I Expect From an Online Associate in Web Development Program? What Can I Do With an Associate in Web Development Degree? Earning a web developer associate degree can prepare you to become a professional in the field. Web developers and designers are responsible for every bit of code and each modification that goes into making a website visually appealing, user-friendly, functional, and navigable. While some students go on to earn a bachelor's degree in web development or a related field, many jobs only require an associate degree—thus, the market offers a variety of job opportunities and room for advancement to graduates with a web developer associate degree. The BLS predicts a record-high job growth of 27% for web developers through 2024, as the demand for web development expertise in mobile and international ecommerce continues to rise. The third-largest college in the North Dakota University System, BSC serves nearly 3,800 students, on campus and online, and offers 20 online degrees in emerging areas of technology, engineering, and business. BSC's web developer associate degree program provides the career skills students need to succeed in the field and the latest industry requirements. The two-year curriculum builds problem-solving skills, research abilities, and attention to detail, while helping students master coding and design software tools. With six campuses across Mississippi, MGCCC is committed to providing accessible education through an impressive selection of comprehensive online programs. Through its participation in the Mississippi Virtual Community College Consortium, MGCCC offers 13 online degree programs — many of which can be completed entirely online — and thousands of individual online courses. The two-year web developer associate degree program prepares students to pursue mid-senior roles in federal and state government agencies, internet companies, and corporate institutions. Students gain expertise in web design and programming, server administration, graphics manipulation, and database integration. Graduates are prepared to take the Certified Internet Webmaster exam. With a reputation for producing the most prepared college graduates in Florida, SPC offers a variety of online professional programs, each carefully co-developed by education and industry experts. SPC’s technology school prepares graduates for the workforce with career-focused programs, including an online AS in web development program. Students build a foundation in HTML, CSS, database techniques, LAN concepts, and image optimization. Riverland occupies three campus locations across Minnesota and offers many professional degrees in business, management, and technology online. Riverland’s online AAS web developer degree combines core, technical, and general education courses to prepare students to manage all facets of web development and design. The curriculum covers essential computer skills, mobile apps, and SEO and analytics, and students complete a portfolio and internship. GNTC offers one of the largest selections of online degrees and diplomas, including programs in accounting, welding, and joining technology. Among GNTC’s offerings is the associate degree for web development, which is available at two of the school’s campus locations and online. The program's coursework combines technical computer concepts, networking, and program design and development with general education in the humanities, social and behavioral sciences, natural sciences, and math. The 64 required credits comprise core and occupational courses, and the program culminates in a web systems final project or internship experience. Online resources for distance students include Blackboard technical support, a fully integrated library database, and a SmartMeasure assessment tool. A longstanding beacon of outstanding higher education in the state of Idaho, LCSC has expanded its reach even further in recent years to include high-quality online programs for a broader range of students. The college offers numerous degrees and diplomas developed especially for aspiring business and justice professionals, nurses, social workers, and teachers, among other areas of career & technical education. LCSC’s online web design and development AAS emphasizes organizational web design, development, and management skills through coursework in math, communication, social/behavioral science, and other general education core concepts. Students must complete both a workshop and internship in computer information technology, as well as a web development capstone, to earn the degree. A technical skills assessment is a mandatory prerequisite of all associate-level web development applicants. Although MSC Southeast is a relatively small school, its academic offerings are not limited. MSC Southeast offers more than 25 degree, diploma, and certificate programs that can be completed entirely online, and dozens more courses are available in hybrid formats. The web developer associate degree requires 60 credits of general education and technical courses. The program strengthens written and oral communication skills and job seeking skills and introduces students to graphic design. Technical coursework includes Java, C++, and VisualBasic programming. Students conclude the degree program with a computer careers capstone project. Additional requirements include high-level liberal arts and sciences core and elective courses. With five Pennsylvania campus locations and a robust online presence, HACC has expanded on its pioneering reputation as the first community college in the state. HACC offers more than 120 programs, many of which are tailored to aspiring technology and web professionals; the college's web development and design programs feature certificate, career associate, and associate of applied science options. The web developer associate degree offers specializations in web application development, interactive web media, and general web studies. The program can be completed entirely online or in hybrid format. Students enhance time management, problem solving, organizational, and technical skills. Graduates pursue positions as web application developers, web designers, and web developers. As Wisconsin’s first publicly funded continuation school, Gateway offers high-quality professional and technical programs that emphasize the development of business partnerships, integrative industry certifications, and practical skill training. The college’s online web developer degree is one of a long list of comprehensive IT degrees, technical diplomas, certificates, and advanced technical certificates offered in this discipline. The IT-web software developer AAS degree requires 60 credits in Java programming, ASP.net web apps, mobile device programming, and advanced PHP. The two-year program is customizable; courses may be taken in any order. Though not required, an internship course is strongly recommended by program staff and advisors. Stark State offers more than 230 degree and certificate programs across seven academic areas. The college features one of Ohio's most comprehensive selections of IT programs, including degrees in administrative services and office applications, information security and digital media, and computer science and information systems. Online web development degree students have a variety of program options to choose from. The following section covers common parts of the curriculum. Introduction to Digital Media: This course teaches students the basics of storyboarding and outlines the software, technology, and critical-thinking skills needed to create animation and other digital media. Most courses in this subject focus heavily on animation, but also aim to develop career skills, such as project and portfolio management. Internet Commerce/Business Principles: This course approaches ecommerce from multiple perspectives: business-to-business, business-to-consumers, and inter-organizational. Students explore the powerful influence of ecommerce in the marketplace today, including how it affects business negotiations, supply and demand, operations, and performance. Web Design I: This introductory web design course familiarizes students with the markup languages, multimedia technologies, and usability and accessibility practices used to design websites. Topics include HTML and CSS coding, layout and typography, and responsive design tools. Basic Animation: Basic animation courses for aspiring web developers involve a variety of forms of the medium, including pencil-and-paper, Flash animation, stop motion, and claymation. The goal is for students to understand how traditional animation methods inform web-based techniques. These courses also introduce editing software, such as Final Cut Pro. Composition: This course covers the fundamentals of basic written English. Lessons impart professional communication skills through applied writing, reading comprehension, and creative writing exercises. HOW LONG DOES IT TAKE TO GET AN ONLINE ASSOCIATE IN WEB DEVELOPMENT? Most web developer associate degrees can be completed online in 12-24 months. Like any online program, completion time depends on whether a student attends full-time or part-time, as well as how and when classes are offered. Some programs are cohort-based, requiring students to complete courses as a group, while others allow students to take courses individually and work at their own pace. Choosing from these options to find the right program to meet your needs is simply a matter of preference; for example, a cohort system may offer less flexibility but provide more opportunities to collaborate with other students on group projects. Most online associate degrees in web development require 60 credit hours, including a combination of general core and field-specific coursework. Associate degree web development graduates meet industry requirements for most web developer jobs. Several factors affect your personal eligibility for a specific position, however, such as location and experience. Below are five of the most common career pathways for graduates with an undergraduate web developer online degree. Web developers are responsible for designing and creating websites. They must consider the visual, technical, and functional aspects of building the site, in addition to possibly creating content for their projects. While some web developers are self-employed, most work in the computer systems design or tech field, with a wide variety of employment options available around the world. Entry-level jobs typically require an associate degree. These professionals provide technical support to consumers. Network support specialists often test and evaluate network systems by performing maintenance checks and offering troubleshooting measures to their clients. User support specialists assist clients with non-network computer application and equipment issues. Many entry-level jobs are available to students with an associate degree, though some employers prefer applicants with a bachelor's. Computer programmers are tasked with writing and testing code to help software and applications run properly. They are translators of sorts, turning programs that software developers and engineers create into a language that computers can understand. An associate degree is acceptable for some entry-level jobs, though many employers prefer candidates with a bachelor's degree or specialized experience. Graphic designers create visual materials including advertising projects, brochures, magazines, and other marketing and promotional material. While some graphic designers are self-employed, many work in PR, marketing, advertising, or for a design firm. Entry-level jobs in graphic design typically require a bachelor's degree. Computer and information systems managers, sometimes called IT managers, are responsible for planning and directing all computer-related operations within a business or organization. Most professionals in this discipline have at least a bachelor's in computer science or a related field and experience in software and web development. Many students earn an online web developer associate degree on their way to pursuing a bachelor's degree in a related field. While an associate degree is the minimum requirement for most entry-level web developer jobs, a bachelor's is the minimum requirement for advancement in the field, and for similar jobs in support, management, and IT. An associate degree for web development introduces students to both technical and business-oriented computer skills, while a web developer online degree at the bachelor level explores programming, coding, and software development in-depth. The following are just a few of the bachelor's programs that associate degree graduates in web development most commonly pursue. Web Development: Students pursuing a bachelor's degree in web development focus on the technical skills needed to create websites that are user-friendly, functional, and inspired. Coursework typically covers UX design, interface usability, and methods of maximizing the benefits of add-on applications and online multimedia tools. Some bachelor's degrees include CompTIA or other industry certifications to prepare students for entry-level job requirements. Web Design: While some schools offer degrees that combine web design and development, a program that focuses solely on web design skills emphasizes coursework in website architecture and aesthetics, as well as the emerging technologies and multimedia tools needed to implement visual design concepts online. Degrees in this discipline also prepare students with the professional skills they need to meet client expectations in a variety of work environments. Web Management: Web management programs, also sometimes called web administrator or technology management degrees, teach students to balance technical abilities specific to online operations and strong general leadership skills. Many degrees in this discipline offer specializations, such as project management, information security, or data analytics. Information Technology: IT degrees provide students with a strong foundation in computer systems and services, networking, security, scripting, and code programming. These programs also build skills in the management and “business” parts of IT. Many programs include valuable industry certifications, such as CompTIA and CIW. Application Development: Application development and online computing degrees cover many of the same foundational concepts as web development and design programs, but with an emphasis on effective computing and ecommerce for mobile users. Courses explore mobile app development, object-oriented programming, and operating systems specific to phones, portable computers, and other mobile devices. Some schools offer application development as a specialization within its BS or BA in web development and design. Students can finance their online web developer associate degree through federal and state scholarships, loans, and grants. Regardless of which path you take toward pursuing financial aid, however, you should start by completing the FAFSA. Completing the FAFSA is not just a requirement at most schools to determine your eligibility for financing; it also shows you and your family the scope of your potential funding opportunities. Aspiring web developers should find a wealth of field-specific scholarships and need-based aid opportunities, especially if they are minority, low-income, or first-in-the-family college students looking to enter this high-growth industry immediately after graduation.